As winter wraps up here in the Minneapolis area, many homeowners are looking forward to enjoying the great outdoors bird watching in their own yards. Unless you’re a confirmed birder, though, having birds in the backyard might not seem important. If you take your cup of coffee and go and sit down just to watch what they do, will you notice just how beautiful and enjoyable they really are. Here are some ways to get more birds and other wildlife to come to your yard. Shelter in bushes and small trees can provide an area for birds to gather and eat in quiet and peace. Shrubs provide the protection and shelter they seek; placing feeders and houses near places of shelter make them more inviting. You can even combine food and shelter with a shrub that has berries. Try a hawthorn bush if you want something that provides protection and something to eat. Water is a great way to bring in many different birds as well as animals to the yard. By having a bird bath, water fountain or other water feature, you’re inviting them in for something to drink. We are able to design many different water features that match your yard and taste. Giving food to those that come to visit is a great way to get them to come back time and time again. 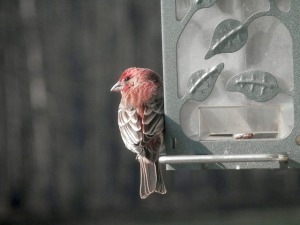 By placing seed in a bird house, corn on the cob in the yard or even sunflower seeds or meal worm feeders can attract many different animals. Hummingbirds and orioles love nectar feeders. With these essentials, you can bring in many different insects, birds and other wildlife creatures that are looking for a little something to eat or drink, or even a place to lay their heads for the night. Having wildlife in your yard can be a great source of relaxing enjoyment and quiet entertainment. If you’re looking to attract more wildlife such as birds, butterflies and other creatures, we can help you plan landscaping changes to incorporate all of these features and more. We are a licensed Minneapolis area landscape design and installation company that is able to provide you with the help you’re in need of.